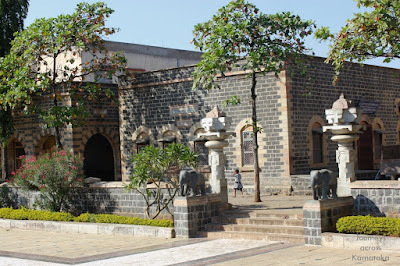 Bagewadi - birthplace of XII Century social reformer Jagatjyoti Basaveshwara's birthplace. Basava was born in a prominent Brahmin family; an enlightened soul, he defied his community's traditional practices and worked for the uplifting the downtrodden section of the society. At a tender age he leaves home & parents and moves to Kudala Sangama where he is trained by his Guru. He gets married and becomes a minister at King Bijjala's court at Kalyana. At Kalyana the Veerashiva revolution starts. Basava and his group had to face lot of opposition and harassment but their spirit is never deterred. Veerashiva's composed hundreds of Vachana - short poems of simple language which carry messages for rightful living. Basava's journey of life ends at Kudala Sangama. 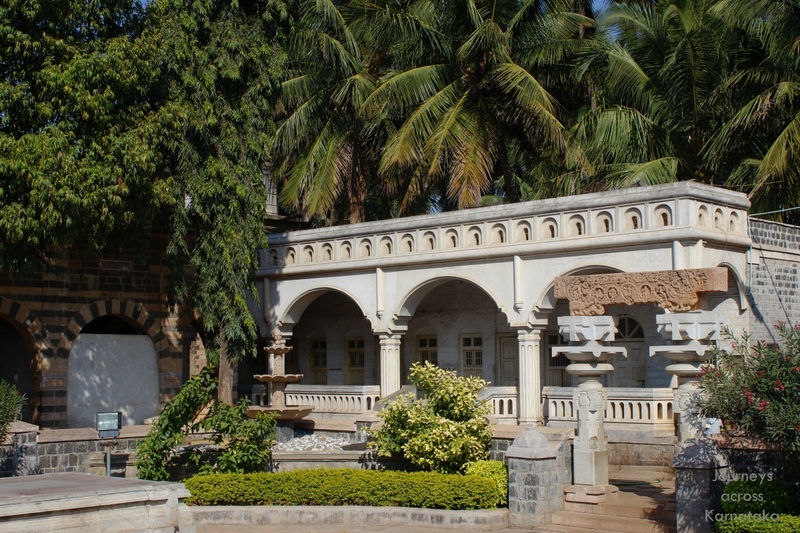 Basavana Bagewadi is a Bagwadi Taluq headquarters in Bijapur district. This was my very first visit to Bagewadi with Pushpa in company. I wanted to see the house where Basava was born. Instead of house we a modern building called Basava Smaraka, memorial for Basava's birth place. The caretaker suggested us to visit Basaveshwara temple as well.. 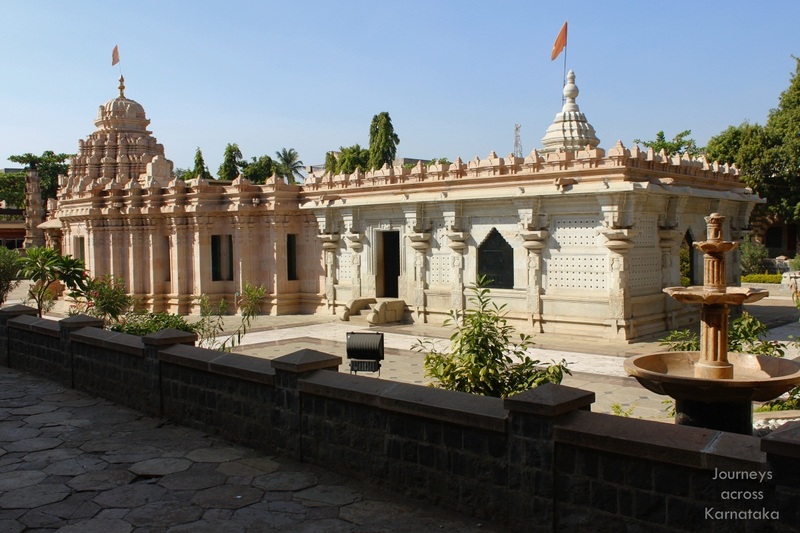 This is an ancient temple restored and renovated recently. 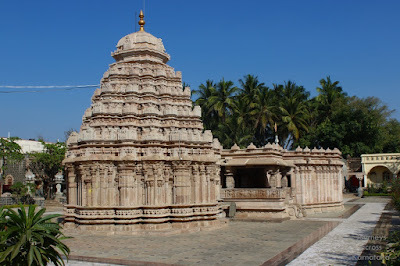 From the looks, it seems like Chalukyan, similar to the temple at Kudala Sangama. This is an east facing temple with one Garbhagriha, Antharala, Natyamantapa and Sabhamantapa. The structure is built with sandstone however the front portion seems like granite. I think its an extension to accommodate an idol of Basavanna (Nandi). Where there is Shivalinga there has to be a Nandi. Around the temple is a school building and rooms for pilgrims camping here. 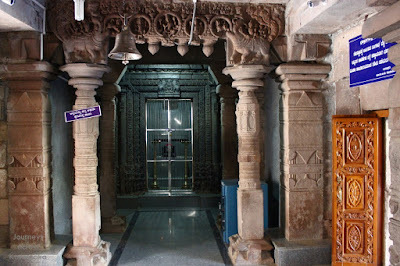 Couple of Torana Gallu (stone arches at entrance) are also preserved here. This building, I'm guessing, houses the temple's kitchen and dining hall. 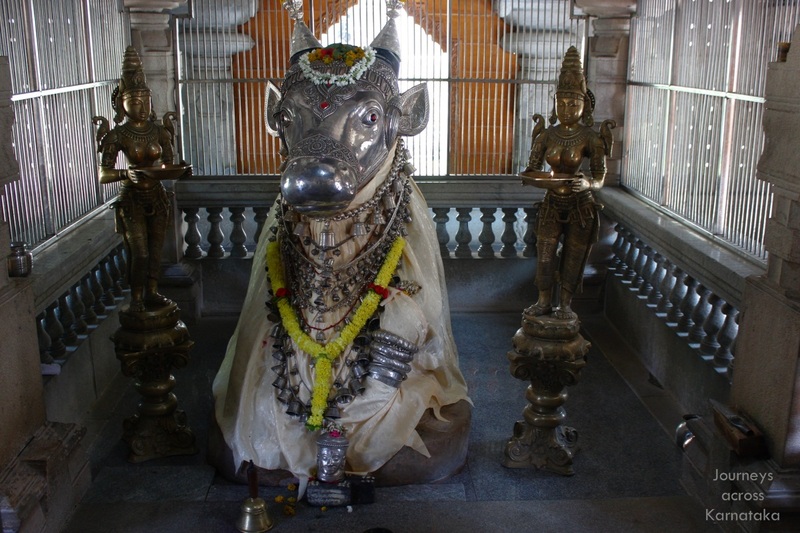 Nandi, covered in silver and flanked by large brass lamps. 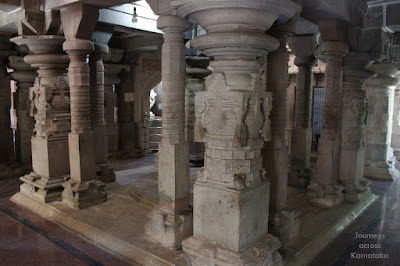 This is the twelve pillared dance floor.. Natya Mantapa. Another view of the Natya Mantapa. 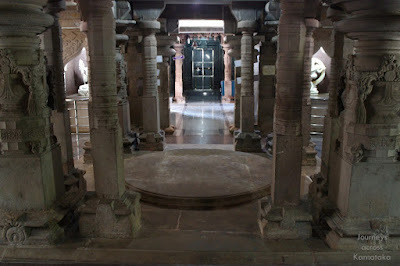 Torana at one end of the Antharala (vestibule). As you see, most of the temple is still supported by the original pillars and beams but flooring, walls and doors are recent addition. Its a peaceful temple as such but this will be buzzing with activity on Mondays, festival days and special days like Hunnime and Amavasya. Thank you for the article Siddeshwar. Really appreciate your interest and efforts.